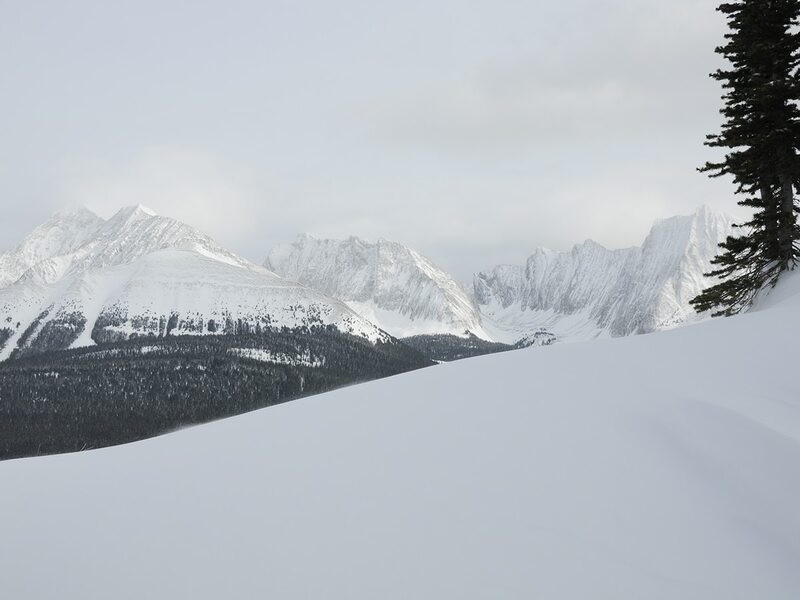 Snowshoeing up Commonwealth Ridge is no easy feat, but you will be rewarded with an up-close view of spectacular Mount Smuts and The Fist. 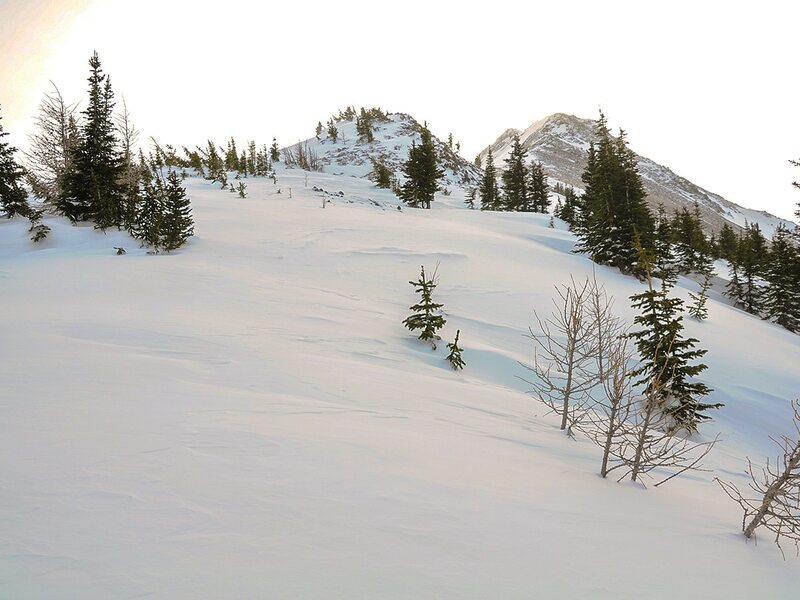 The wonderful cornice scenery on the upper slope make Commonwealth Ridge an exciting snowshoe outing. 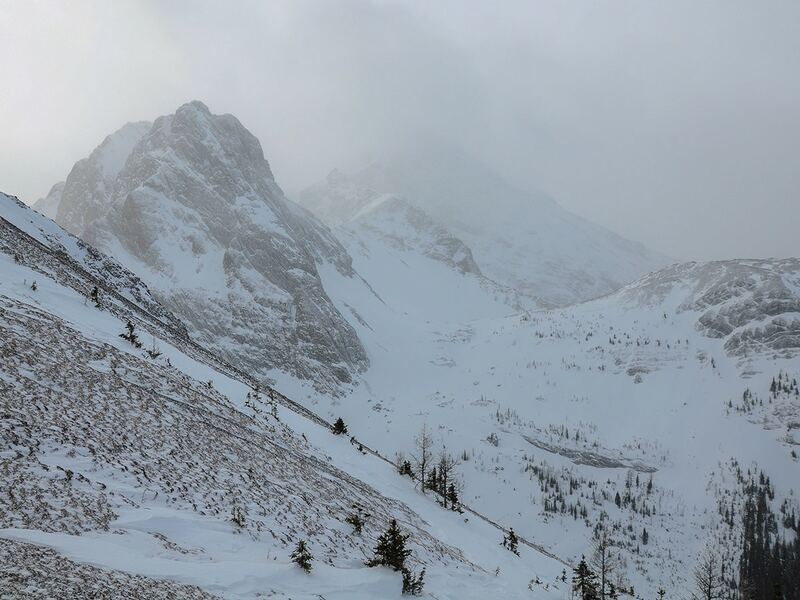 This trip is only suitable for people with avalanche training and avalanche gear. 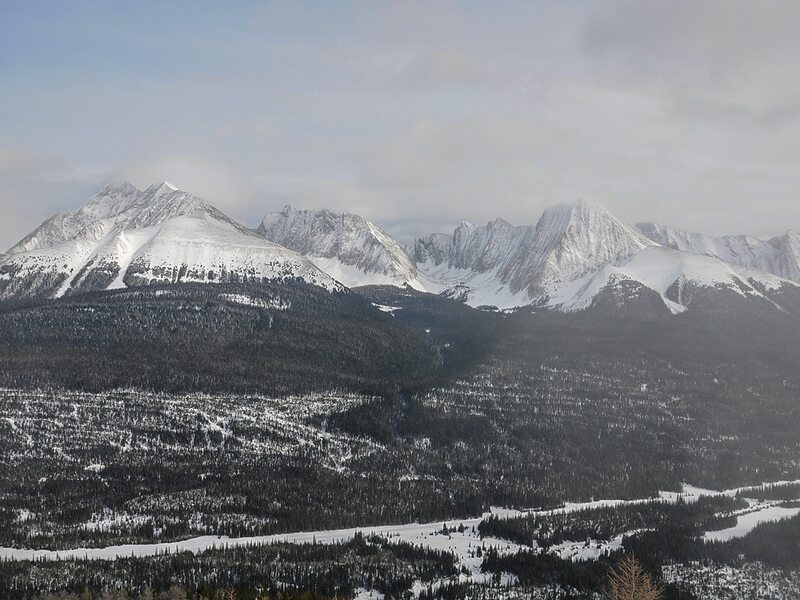 From the Canmore Nordic Centre, continue west on the Smith-Dorrien (Hwy 742) as it winds up into the Spray Valley for 37.5km. 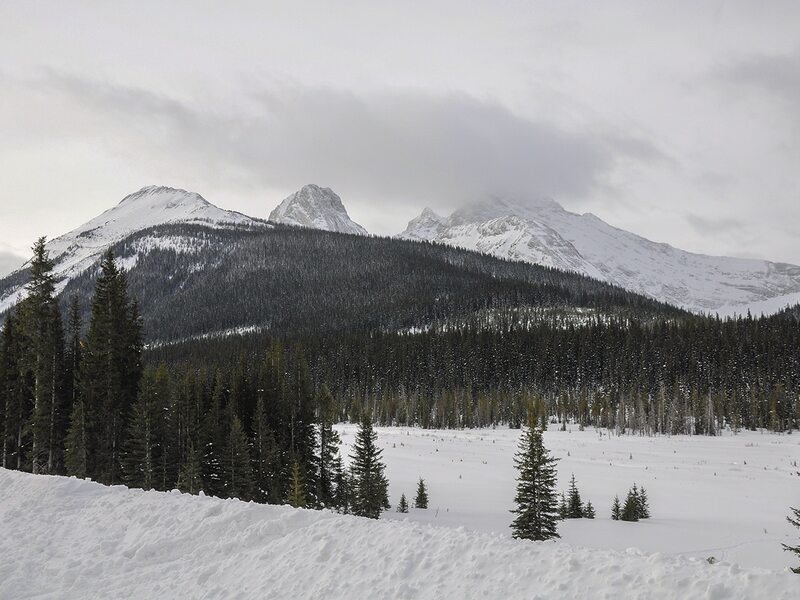 You’ll notice a turn-off to your right for Mount Engadine Lodge, don’t take it but continue 2.0km past this. Park on the Smith-Dorrien. 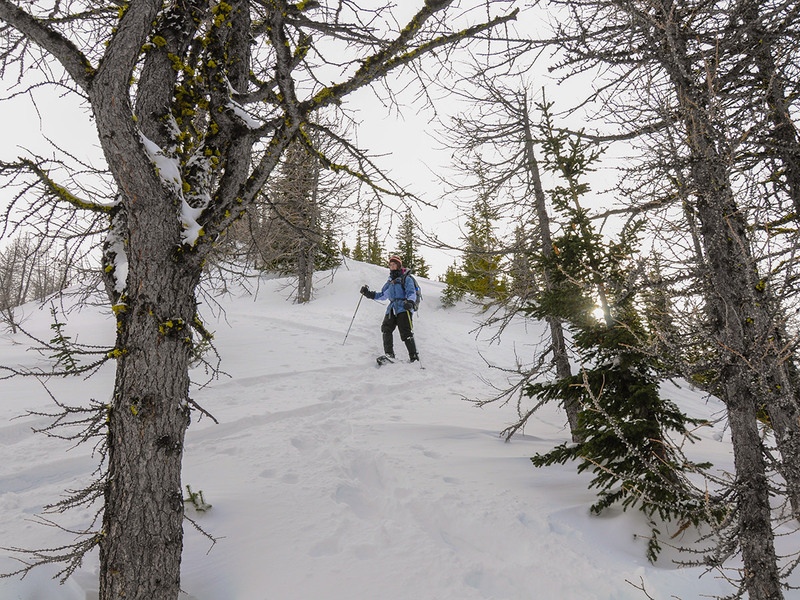 Anyone on a snowshoe trip should have Avalanche training, we recommend AST 2 for all backcountry travellers, and AST 1 is the minimum. It is important to note that when travelling through avalanche terrain it is extremely valuable to always have a companion. 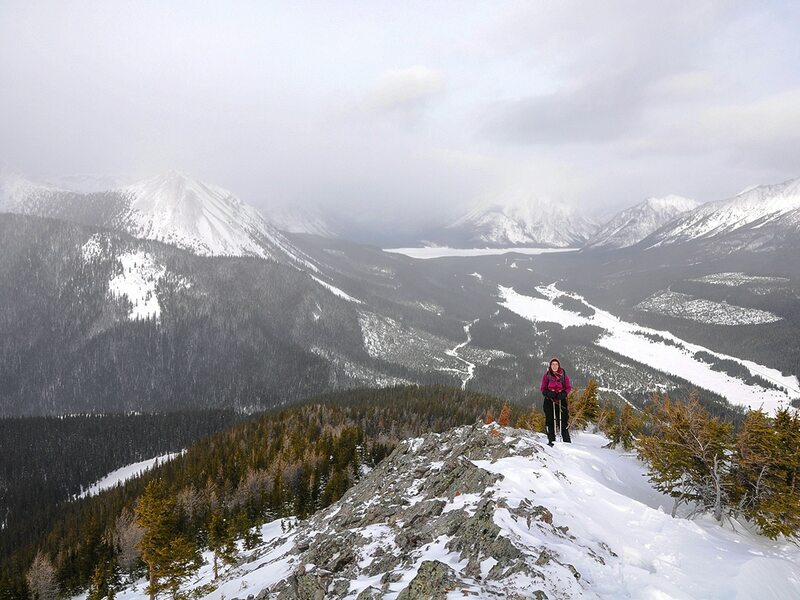 The trip up Commonwealth Ridge is a spectacular snowshoe trip, rated as Challenging – Class 2 by Alberta Parks, that takes you to a relatively high elevation (2400m). 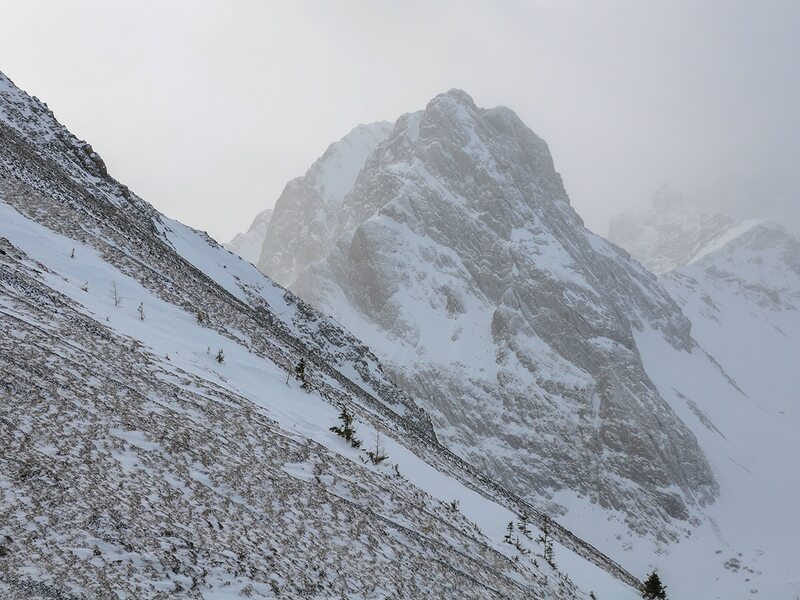 It does, however, require a significant effort to ascend 600m on snowshoes, and the views don’t open up until you have almost reached the top. You’ll also need some route-finding skills in your back pocket, as there is no well-defined trail in the winter. 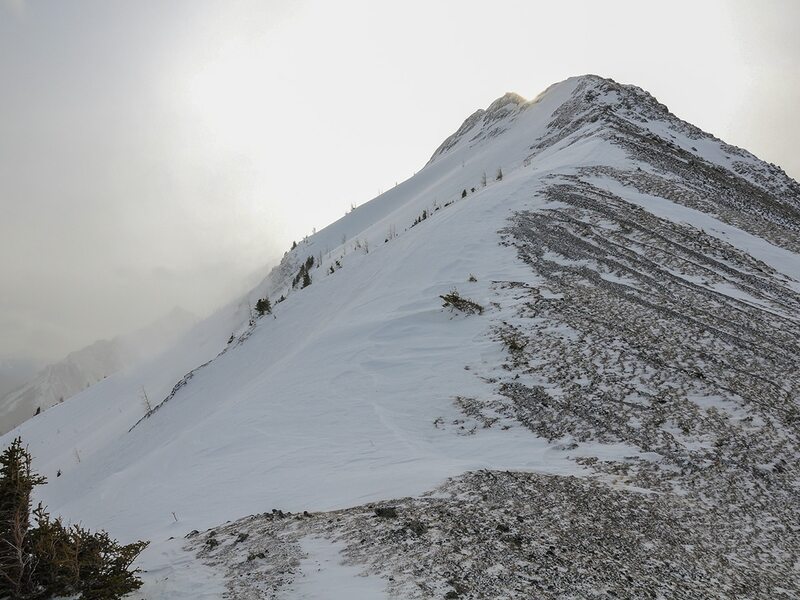 The ridge is not terribly difficult to navigate, however there will not likely be a distinct trail to follow on this route. 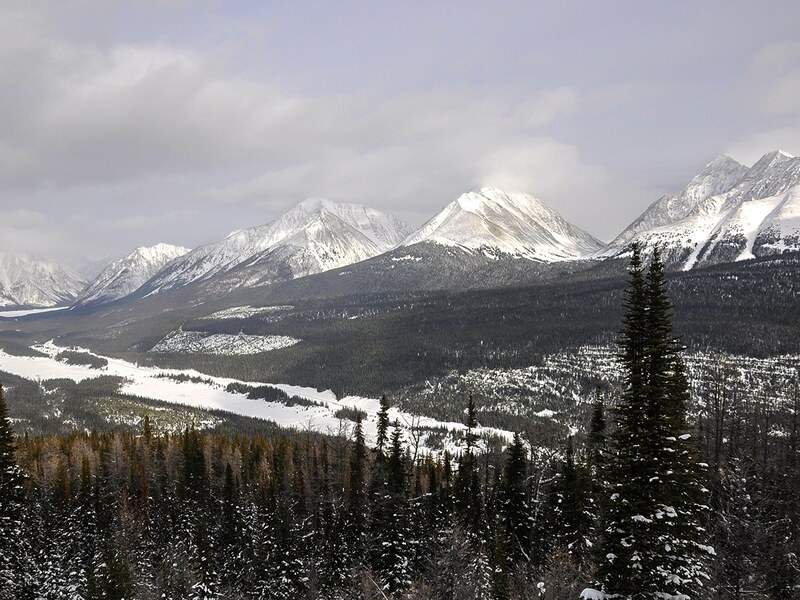 The trail starts along the Spray Lakes road about 2.0km south of Mt. Engadine Lodge, look for other cars parked along the roadside. It is the same trailhead as the shortcut approach to Commonwealth Lake. From the road, follow the trail across the flats, then ascend gently through forest until you reach a cutblock. 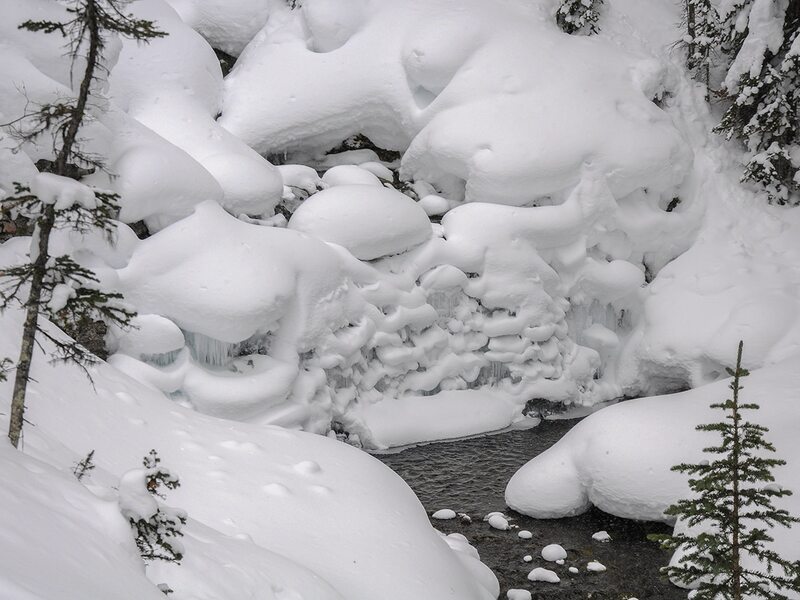 At this point the trail is likely to disappear and you will see numerous ski tracks – some old, some new, some busy, some not – and crisscrossing old roads that are confusing at times. Roughly west (straight) leads to a well-defined trail that parallels Commonwealth Creek. Heading left (south) from the cutblock leads to several forking tracks, all of which appear to ascend the ridge. For no particular reason we headed left and ascended, but others clearly went straight and began their ascent closer to Commonwealth Lake. Both approaches appear similar in difficulty. The ascent is quite difficult, although never exposed or dangerous. It’s not particularly steep for a summer hike, yet on snowshoes is much more challenging. The views are absent until you reach the ridge crest around 2250m. After passing the first bit of larch trees, the views become spectacular. 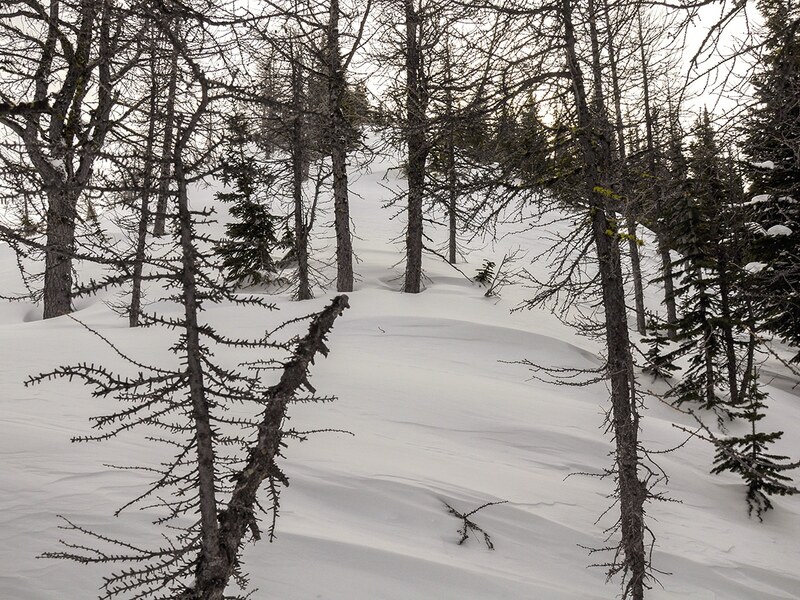 Treeline is just below 2400m, which is right below a point where the ridge narrows and steepens. This is the end of the trip as continuing farther along Commonwealth Ridge would involve some light winter scrambling. 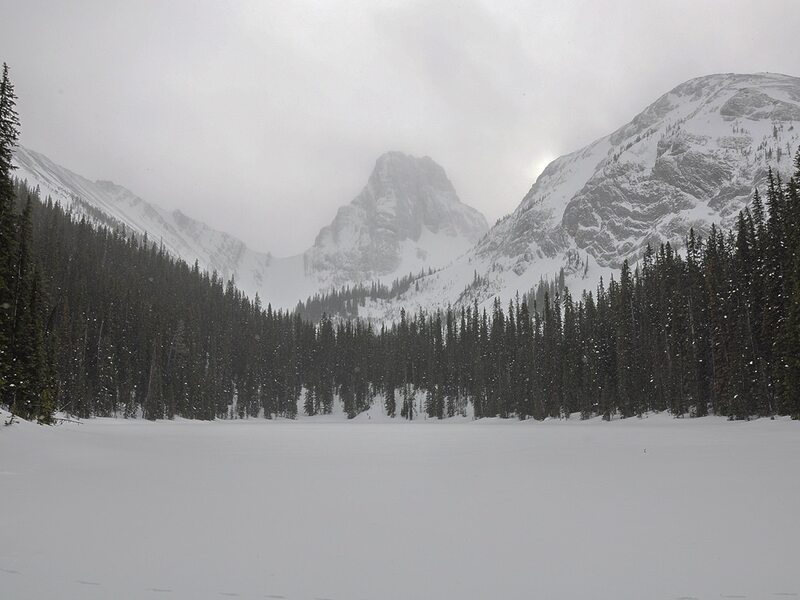 The views from this vantage point are spectacular, however, and allow you to overlook many other snowshoe trips in the area, including Chester and Rummel Lakes, Commonwealth Lake, and Hogarth Lakes. 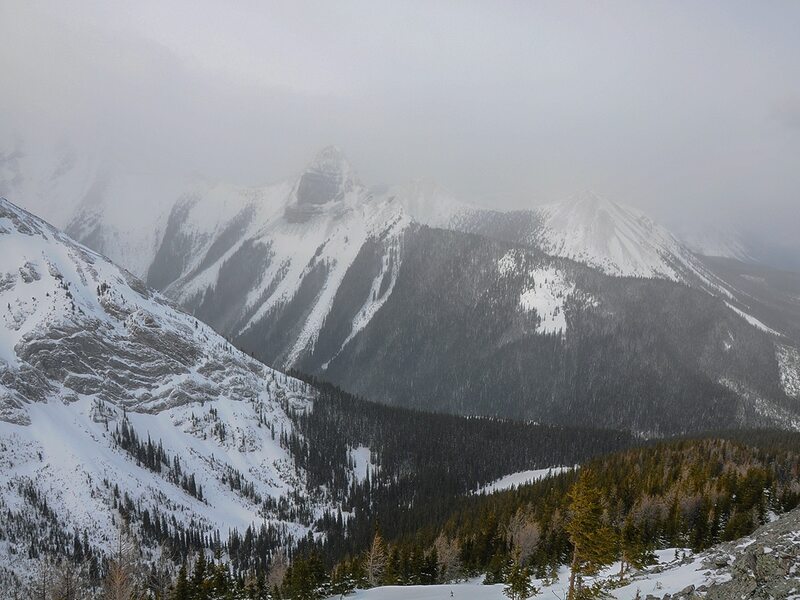 It is always special to be so high up in K-Country in winter! On the descent, you may detour to Commonwealth Lake, passing the beautiful falls on Commonwealth Creek. This route makes for a longer trip, yet adds some diverse views to the day. We think it’s worth it. 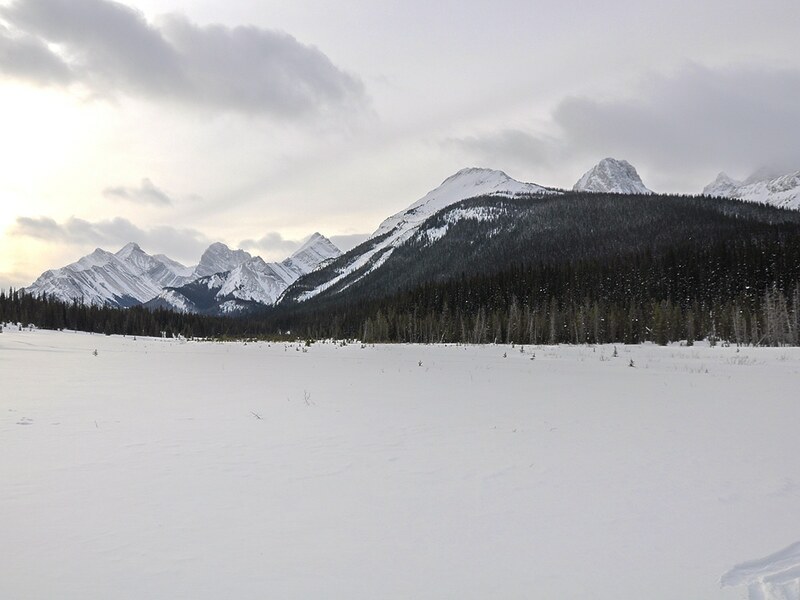 Mount Engadine Lodge is down the road. Save the drive and make a weekend out of the trip by booking a couple of nights here.